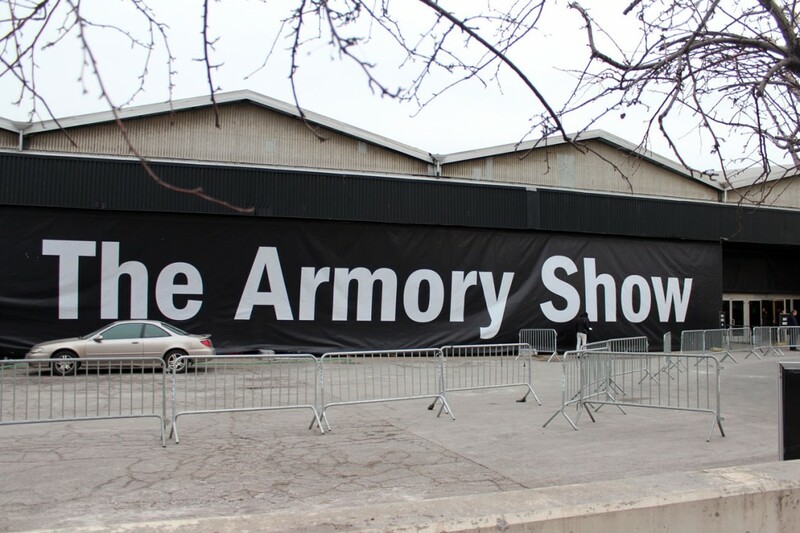 NEW YORK—In the art world, March Madness means Armory Arts Week. 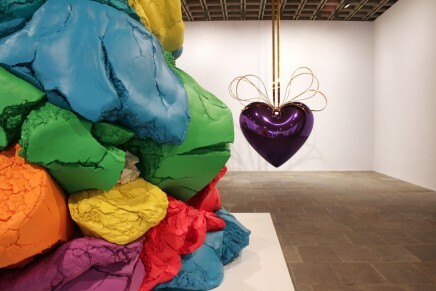 The city is rife with art fairs, special events, forums and exhibitions, and the last Whitney Biennial at the museum’s Madison Avenue site. 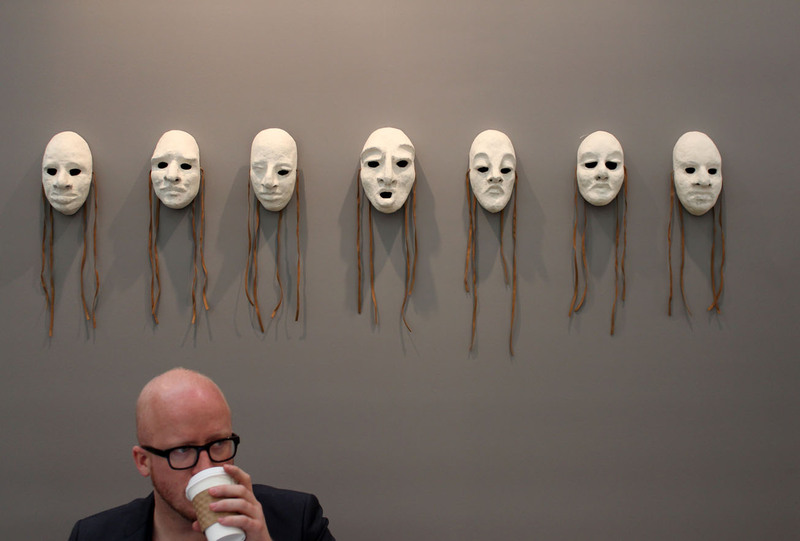 This year, the biggest event of all, the Armory Show features contemporary art from more than 100 international galleries at Pier 94. A lot is familiar if you attend the show annually, but there is always something amazing to see and even buy: innovative projects (Karin Sander is offering 3D self-portraits, you can be the art); a series of photographs of women artists reading; art inspired index cards from a library card catalog; a Carrie Mae Weems triptych; works by artists included in the Whitney Biennial; and much more. A selected overview follows. At left, “The Wizard,” (acrylic and silkscreen ink on metal panel, oil on canvas with self-hardening clay) 2012 by David Salle at Galerie Thaddeus Ropac pf Paris. 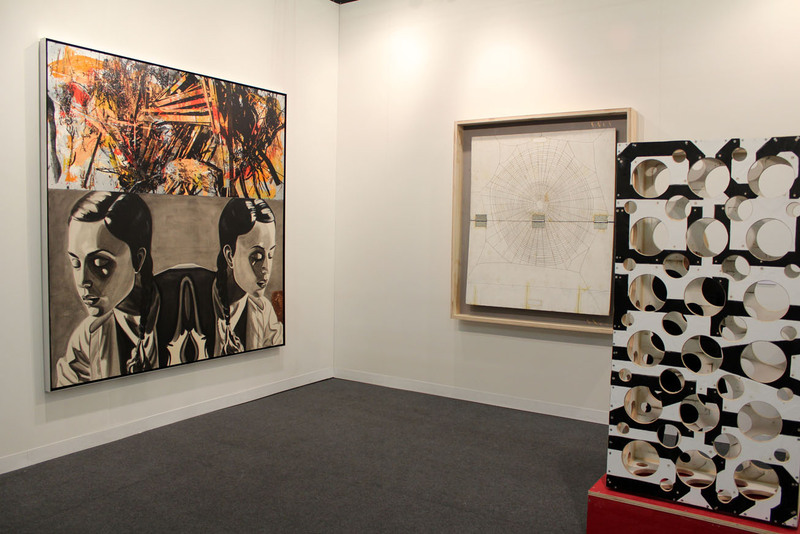 At right, two works by Tom Sachs. 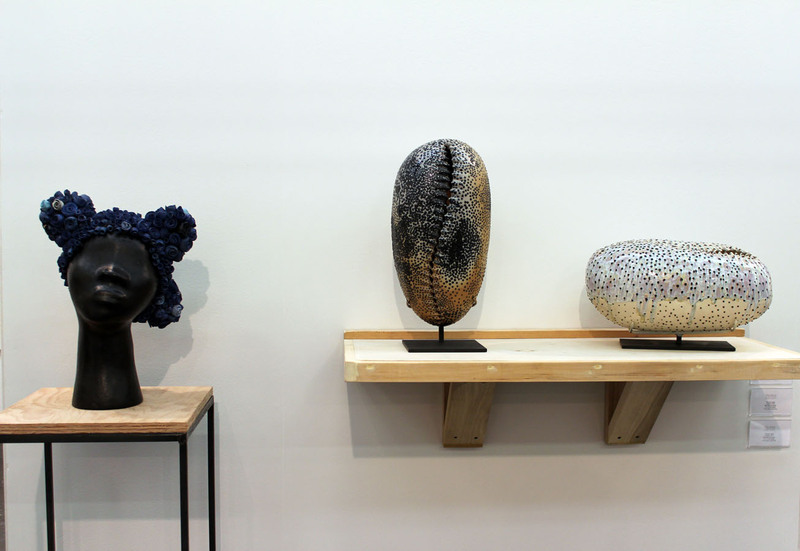 From left, “Untitled,” 2014 (terra cotta, porcelain, india ink, epoxy); “Untitled,” 2013 (salt-fired porcelain); “Untitled,” 2013 (salt-fired porcelain), all by Simone Leigh at Tilton Gallery of New York. 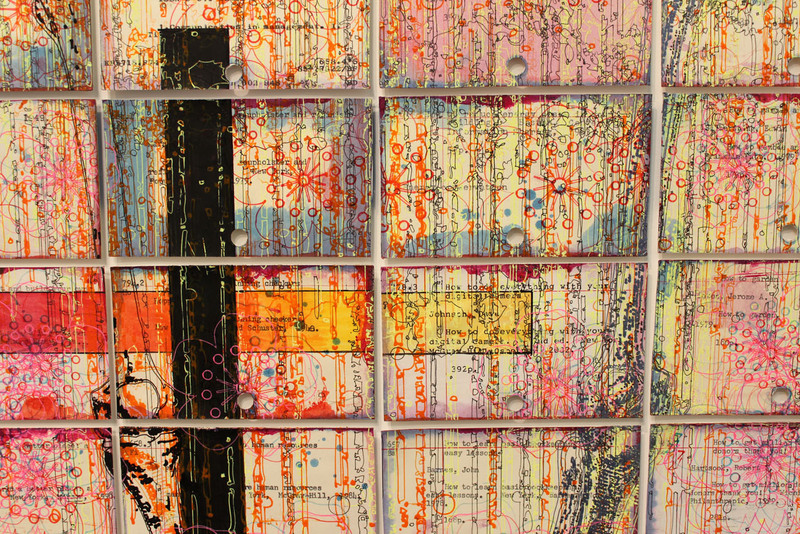 Detail of “How To,” 2013 (ink pen and pencil on library cards, in 40 parts, unique) by Matthew Wienstein at Carolina Nitsch of New York. 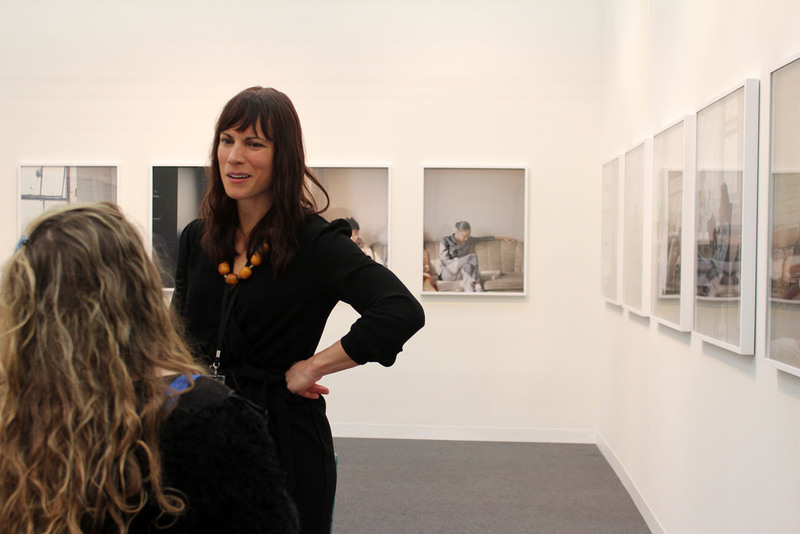 Carrie Schneider talks with a visitor about her “Reading Women” series at the Monique Meloche Gallery of Chicago. At right, her photograph of artist LaToya Ruby Frazier reading. 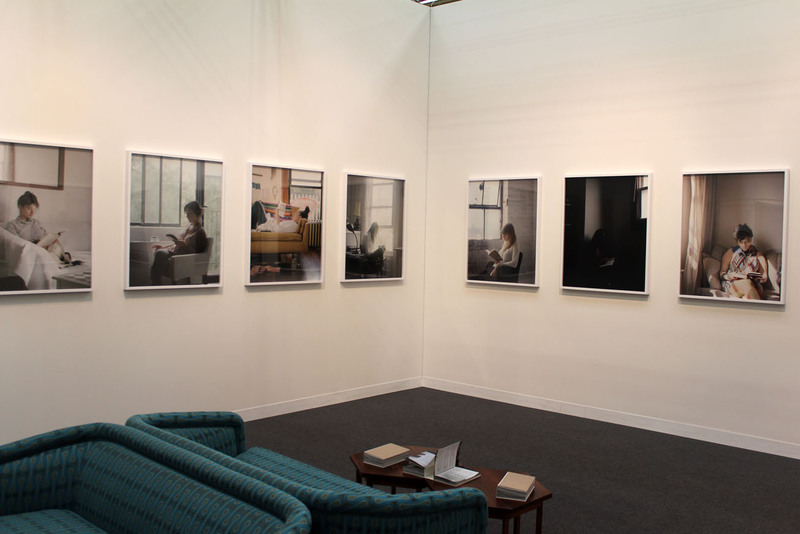 Installation view of “Reading Women.” Fourteen photographs are on view at the Armory Show, there are 70 images in the entire series. 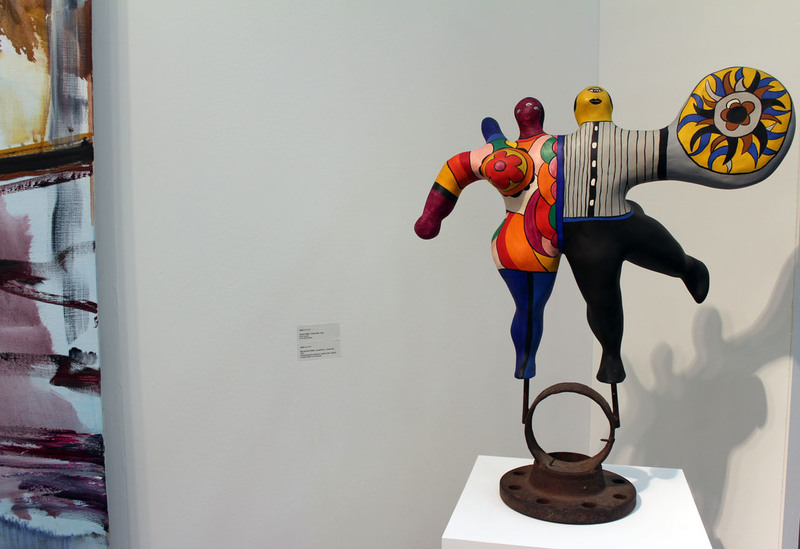 “Les patineurs – Couple aile,” 1973 (painted polyester and base in metal by Jean Tinguely) by Nikki de Saint Phalle at JGM Galerie of Paris. “The Palmetto Libretto” 2012 (pastel and graphite on paper, part 2 of a multipart work. 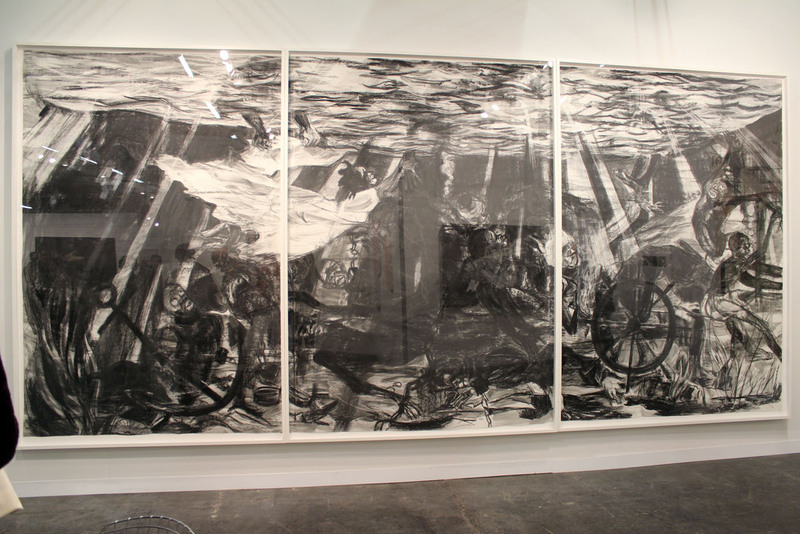 This one’s a sketch for an American comic opera with shipwreck and cargo) by Kara Walker at Sikkema Jenkins of New York. 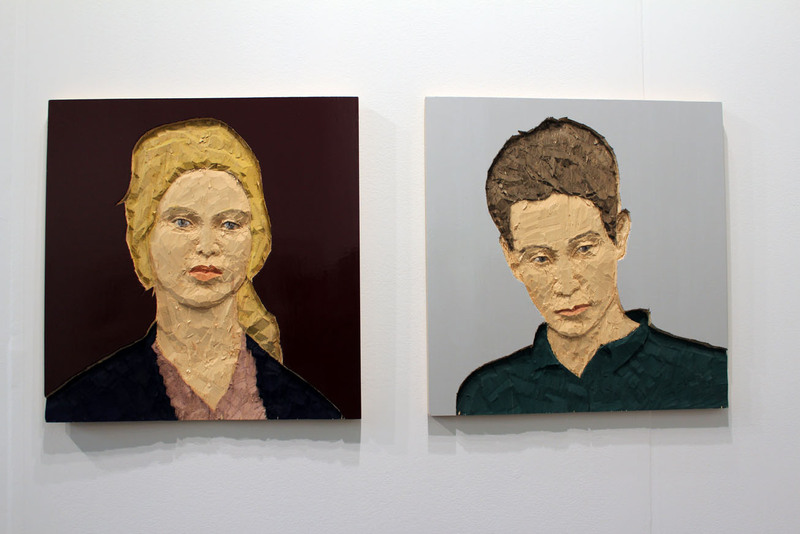 From left, “Blonde Woman with Pink Shirt” and “Man with Green Shirt,” both 2012 (painted wawa wood) by Stephan Balkenhol at Monica de Cardenas Galleria. Detail from “Specimen Series: Berlin Apartment Wieland Strosse 18, 12159 Berlin, Germany,” 2011 (polyester fabric, 14 pieces overall, edition of 3) by Do Ho Suh at Lehmann Maupin of New York. 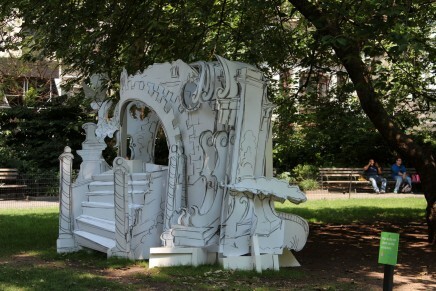 At last year’s Frieze NY, the gallery featured the entire structure that contains the fixtures and elements on exhibit now. 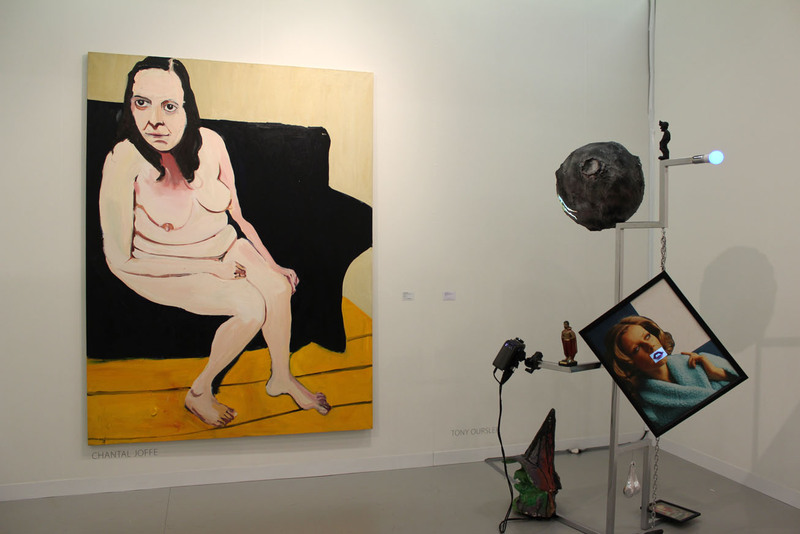 From left, “Self Portrait Naked on New Blue Sofa,” 2013 (oil on canvas) by Chantal Joffe and “Persona Non Grata (orbital),” 2014 (mixed media, video projection) by Tony Oursler at Galerie Forsblom of Helsinki. A trio of 3D sculptures by Karin Sander. Stop by Karin Sander‘s project at Booth 801 where she is capturing images of people with a 3D White Light Scanner (the set up looks like you are posing for a regular studio photograph). In several weeks Sander, who is based in Berlin and Zurich, will produce a plaster 3D sculpture of you produced using a 3D printer. 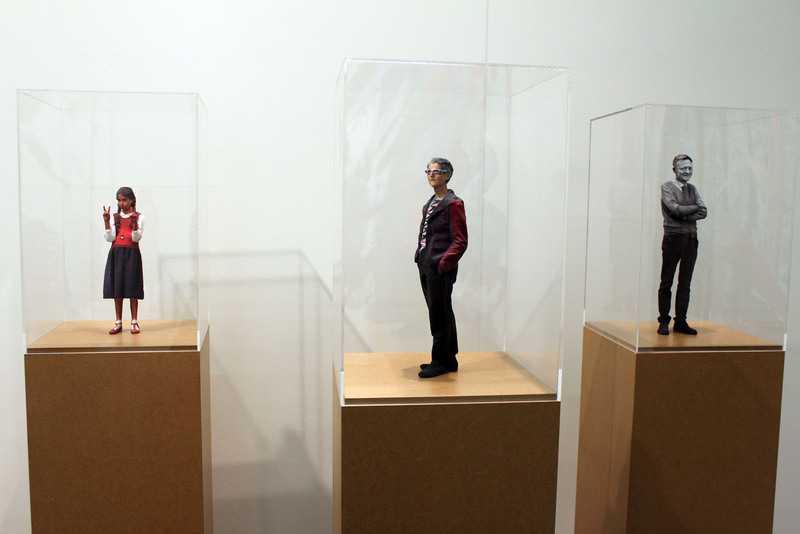 The actual printing take four to five hours and produces a mini-me 5:1 scale version of you. 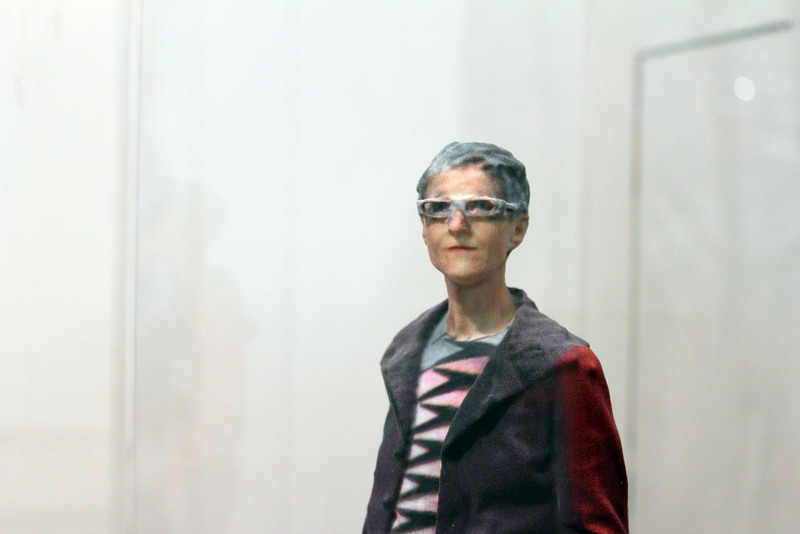 Detail of 3D figure by Karin Sander. 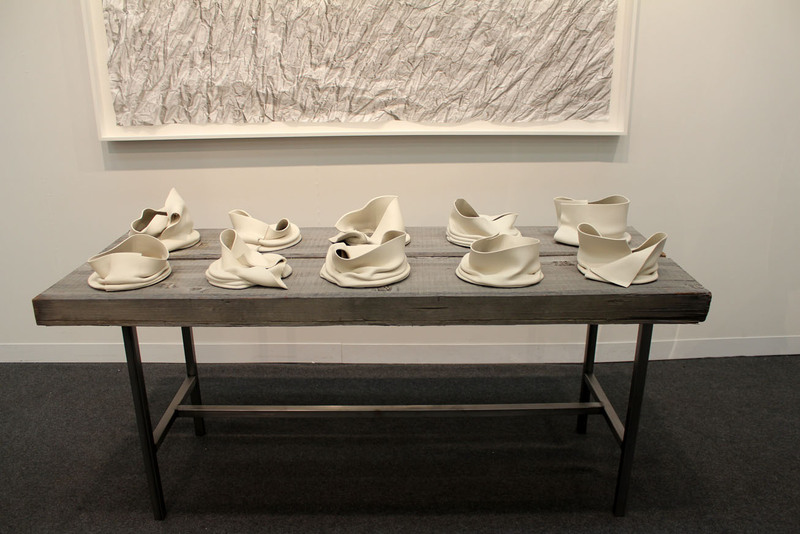 “Recumbent Fold,” 2013 (Bisque fired unglazed porcelain in four parts on table) by Alyson Shotz at Carolina Nitsch of New York. 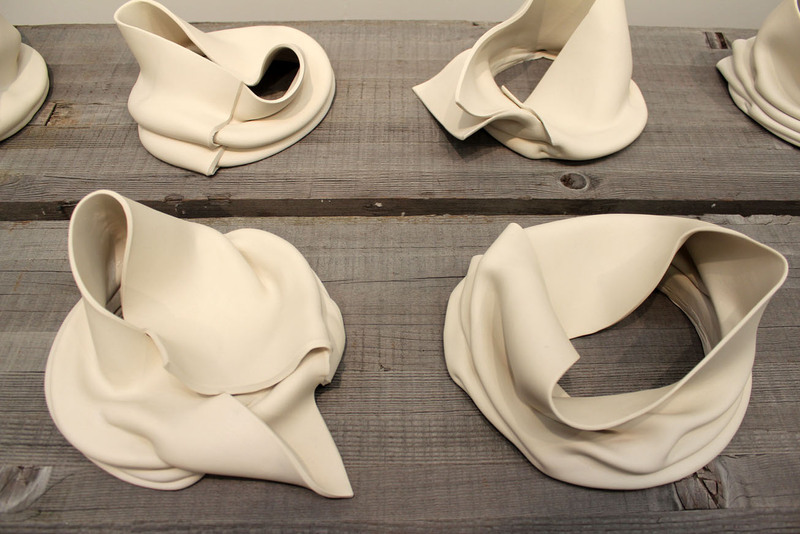 Detail of “Recumbent Fold” by Alyson Shotz. 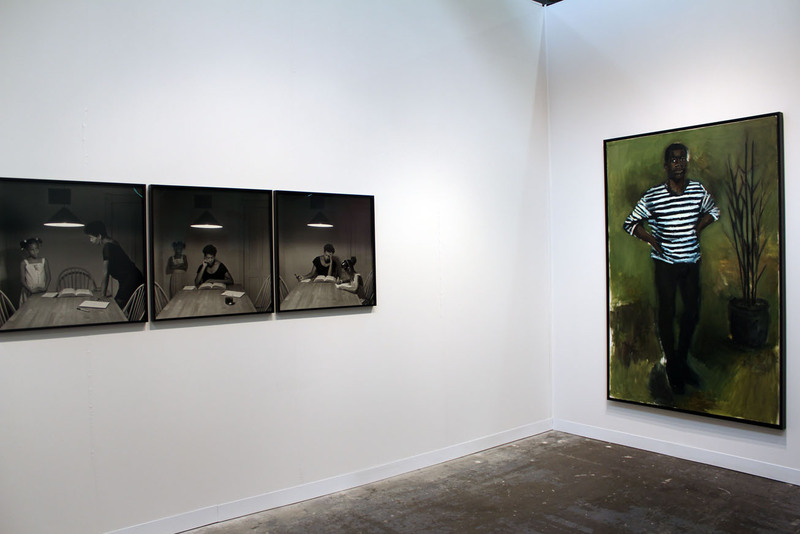 “Untitled (Woman with Daughter), 1990 (silver print, edition of 5 with 1 artist proof) by Carrie Mae Weems and “2pm Salamanca,” 2013 (oil on canvas) by Lynnette Yiadom Boakye at Jack Shainman Gallery of New York. 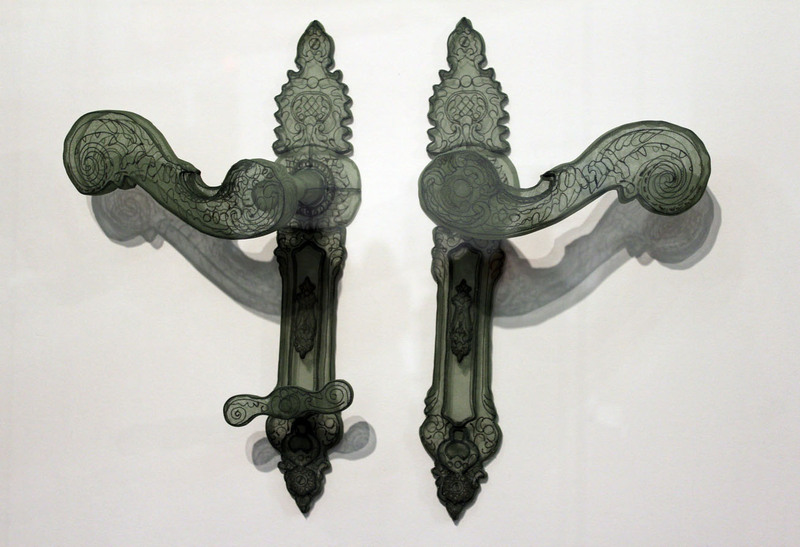 A survey of Weems’s work is on view across town at the Guggenheim Museum. Carrie Mae Weems: Three Decades of Photography and Video, documents the evolution of her career. 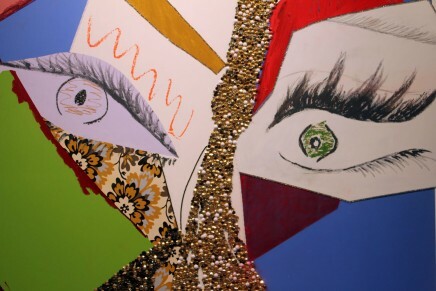 The exhbition runs through May 14, 2014. 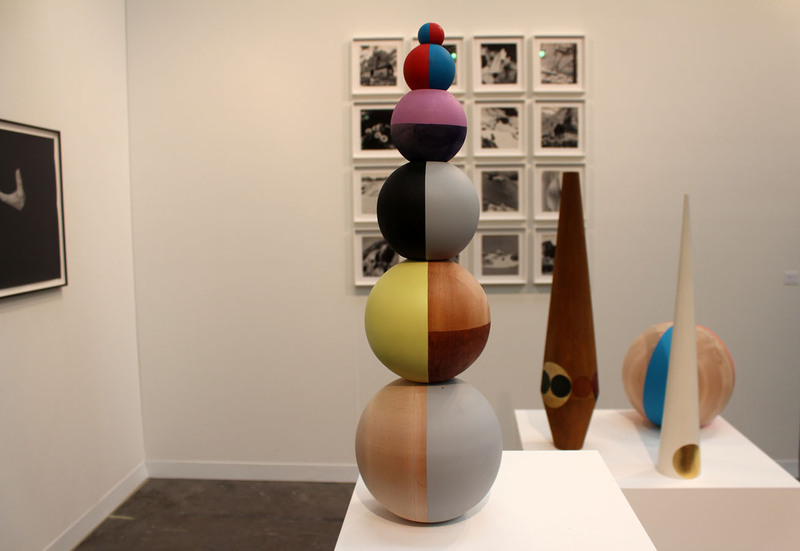 “Untitled (sculptures),” 2011 by Claudia Wieser at Sise + Hoke of Dusseldorf. Ceramic performance masks worn and made by My Barbarian, a collective consisting of Malik Gaines, Jade Gordon, Alexandro Segade, included in this year’s Whitney Biennial, at Susanne Vielmetter Los Angeles Projects.